And it was not as if Mullan was a sentimentalist: this was a tenacious investigative journalist whose working life was intrinsically linked to the events and enquiry into Bloody Sunday in Derry. He was no stranger to fame and his ferocious work as a human rights campaigner took him into the company of global figures like Rosa Parks, Bill Clinton, Mick Jagger, even the Dalai Lama. But with Banks it was different. This was the person to whom Mullan had attached all his childhood ambition and fears growing up as a child in the Creggan, just as the nationalist movement in Derry was about to combust. 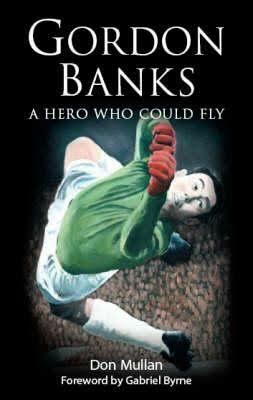 Over dinner at an Italian restaurant in midtown Manhattan in 2004, Don Mullan told Irish actor, Gabriel Byrne, about the positive influence the great English goalkeeper, Gordon Banks, had on his growing up in war ravaged Northern Ireland. 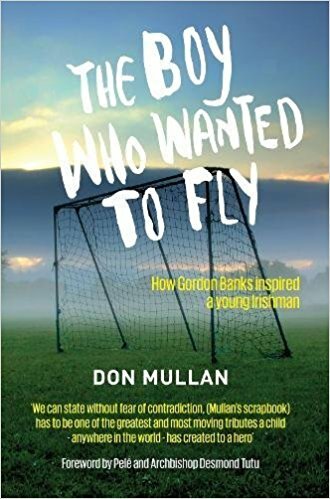 The story also included Mullan’s fondest memory of his father, who somehow managed to arrange for his teenage son to meet Gordon Banks just six weeks after Banks had pulled off what many consider the greatest save in World Cup history from Brazil’s Pelé during the 1970 Mexico World Cup. Byrne listened attentively and at the end he the meal he encouraged Mullan to write a book about his experience. “That’s one of the most moving sports stories I have ever heard, Byrne told the Irish author and humanitarian. And, so, in the lead-up to his 50th birthday, Mullan decided to write a boyhood memoir on how, his hero, the 1966 World Cup winning England goalkeeper, had filled his childhood and adolescence with the magic of dreams. “Derry’s Creggan Estate where I was born and grew up, was a peace loving community. Our neighbours were the most decent and caring one might ever wish to live amongst. Yet, in the 1970s many in our community turned to violence. The question is ‘Why?’ Was it because we had a genetic defect that made us prone to violence? Or, because we were violent by nature? Of course not! The root of violence is systemic injustice of which there was plenty in Northern Ireland. Mullan’s memoir places the role of sport within the developing crisis, including his own struggle with violence in the aftermath of Bloody Sunday when he seriously considered following his best friend into the IRA. One fascinating insight is of an aggressive raid on his home by the British Army which ended with him holding court before several soldiers in which he had them agreeing that they too would be angry if the shoe was on the other foot and Irish soldiers were doing to them in England what they were doing to in Derry. Don Mullan, did not follow the path of violence. He sought to achieve systemic change through non-violence. His memoir was optioned by the BBC in 2006. It was also republished by the British publisher, Legend Press, in 2013, as “The Boy Who Wanted to Fly” with a foreword by Pelé and Archbishop Desmond Tutu. The book is currently being translated into Portuguese in Brazil and all royalties will be donated to Hospital Pequeno Principe (The Little Prince Hospital), Brazil’s largest pediatric hospital. The foreword by Pelé and Tutu may be read by clicking here.